​The Mazda6 was designed to achieve up to 35 miles per gallon meaning you'll save more money on your gas bill each month whether you commute an hour to work every day or just use it to run a few errands. Additionally, engineers designed this car to put out an impressive 250 horsepower. 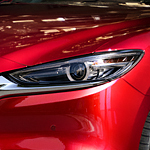 If you would like to test drive the new 2018 Mazda6 to see these design features and many others for yourself, then feel free to stop on by our showroom floor at Budd Baer Mazda located in Washington today!